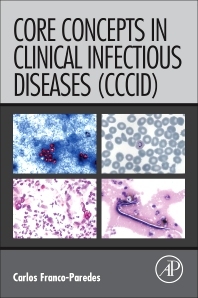 Core Concepts in Clinical Infectious Diseases (CCCID) provides medical students and researchers, infectious disease fellows, and practicing clinicians with key clinical concepts in the differential diagnosis and workup of infectious diseases. With the use of tables, charts, and problem-oriented medical diagnosis, it will provide a way of organizing and thinking about commonly seen clinical presentations of infectious diseases. Instead of discussing each disease process or any particular infectious process, this book will assist clinicians in seeing the forest and not focusing on the leaf. Graphs and tables have been constructed over 14 years of taking notes, teaching clinical infectious diseases, and discussing real clinical cases. This book is not about acquiring the structure of infectious diseases that is presented in classic textbooks of infectious disease; instead, it is about refining the process of putting the pieces together in clinical thinking to achieve an accurate clinical diagnosis and thus improved patient care. Dr. Franco-Paredes is a practicing clinician in internal medicine and infectious diseases with an MPH in global health and 14 years of clinical activities in travel and tropical medicine, HIV/AIDS, tuberculosis, leprosy, vaccine-preventable diseases and general infectious diseases. Concomitantly with clinical duties, he has also participated in international consultations in global health over the last 10 years. His interests have included epidemiological and clinical aspects of Neglected Tropical Diseases (NTDs) and vaccine-preventable diseases. Dr. Franco-Paredes is currently a Consultant Coalition against Typhoid Program at Sabin Vaccine Institute, Washington, D.C; and Professor of Pediatric Infectious Diseases at the Hospital Infantil de Mexico, Federico Gomez.